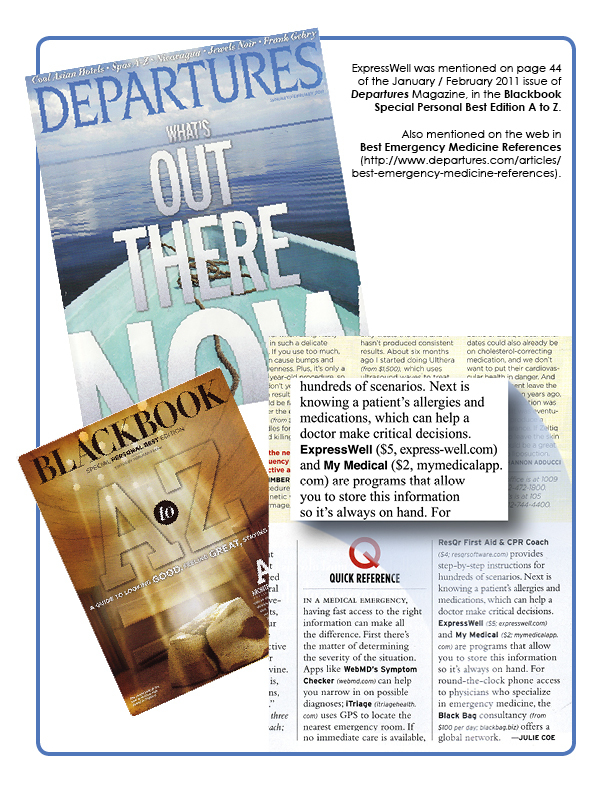 Departures Magazine, January / February 2011 | ExpressWell, Inc.
Health apps and services that put essential details and guidance at your fingertips. In a medical emergency, having fast access to the right information can make all the difference. First there’s the matter of determining the severity of the situation. Apps like WebMD’s Symptom Checker (webmd.com) can help you narrow in on possible diagnoses; iTriage (itriagehealth.com) uses GPS to locate the nearest emergency room. If no immediate care is available, ResQr First Aid & CPR Coach ($4; resqrsoftware.com) provides step-by-step instructions for hundreds of scenarios. Next is knowing a patient’s allergies and medications, which can help a doctor make critical decisions. ExpressWell ($5; express-well.com) and My Medical ($2; mymedicalapp.com) are programs that allow you to store this information so it’s always on hand. 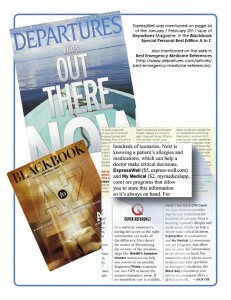 For round-the-clock phone access to physicians who specialize in emergency medicine, the Black Bag consultancy (from $100 per day; blackbag.biz) offers a global network.